Homely food needs love, too. Sometimes I cook something that’s, well, not-so-pretty and I think, should I really bother to post this? it looks kinda bad. However, I recently got My French Kitchen from the library (written by Joanne Harris, author of Chocolat ) and I’m so enamored with it, I’m posting this anyway, its ugliness be damned. 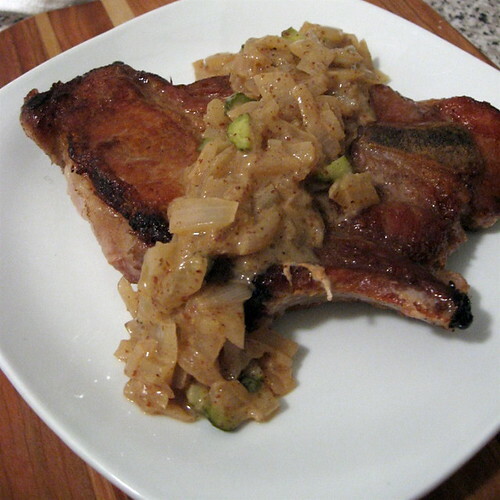 The pork chop is basically just pan-fried in two tablespoons of butter; nothing fancy about it. It’s the mustard sauce that’s really where it’s at. After cooking the pork chops, remove and set aside. Add the onions and cook gently. Pour in the wine, increase the heat, and reduce by half. Mix in the mustard, reduce heat, then whisk in butter to form a smooth, glossy sauce. Stir in the cornichons and serve with pork chops. Pickles, onions, and mustard: what could be better with a big piece of fried meat? That pork chop doesn’t look too homely to me. As long as it tastes good, well, then you are in business. Now, if only the saying “so homely, it’s cute”, actually worked in real life. It wasn’t just good; it was goooooood in that way only fried meat can be. It looks pretty good to me. I love the mustard-onion idea. I think it looks beautiful. Did you know that in the UK “homely” means more what we use “home-y” for? So, these are homely in the nicest sense of the word! I know what you mean about the photography issue. I will sometimes put less sauce on something or put the sauce on the plate and then the chop or whatever on top of the sauce just for the photo. Then, since the model is usually my meal [I plate and serve others’ food so they can eat it while it’s still warm], I’ll add more sauce or whatever before eating it. All that said, this looks pretty delicious. Ha â€” I totally do that! I make sure my husband and kid each have a plate, then I plate the food I’m going photograph, then eat it. And in this case, yes, I added more sauce to the plate first.